What if I told you that you could go from placing an entire watermelon onto your counter, to devouring slice after slice within mere seconds? This amazing Melon Slicer allows you to do just that. Not only will it make eating watermelon that much quicker to get to, but it also looks like a lot of fun and quite satisfying to use. The Melon Slicer is made from stainless steel along with hard plastic handles, can easily slice through tough melon skin like it’s butter, and will be able to slice through any melon with a max diameter of 10 inches. The unique giant Melon Slicer can not only be used to slice watermelon, but it also works great for cantelopes, pineapples, honeydew, and plenty of more types of fruits. You could probably even use it as an apple and other small fruit slicer as well. 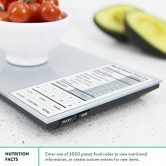 A perfect gift idea for parents with families who love consuming watermelon, or anyone who just loves sliced melons, the unique Melon Slicer will slice any melon into 12 equal parts with ease.